NASA's next exoplanet-hunting space telescope has arrived in Florida, two months ahead of its planned launch. 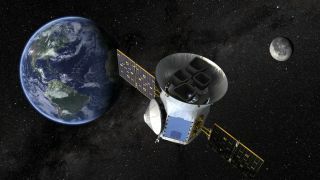 The Transiting Exoplanet Survey Satellite (TESS) was delivered via truck to NASA's Kennedy Space Center (KSC) on Monday (Feb. 12), agency officials said. The spacecraft made the journey from the Dulles, Virginia, facilities of the aerospace company Orbital ATK, which had spent the last year building and testing TESS. TESS is scheduled to lift off atop a SpaceX Falcon 9 rocket no earlier than April 16 from Cape Canaveral Air Force Station, which is next door to KSC. The spacecraft will then spend at least two years studying more than 200,000 of the sun's closest and brightest stellar neighbors, looking for tiny brightness dips caused by planets trekking across the stars' faces. NASA's prolific Kepler space telescope has found nearly 2,500 confirmed exoplanets using this same "transit" technique. On Feb. 12, 2018, TESS arrived at NASA's Kennedy Space Center, where the satellite will undergo final preparations for launch, which is scheduled for no earlier than April 16. TESS team members have said they expect to find several thousand planets during the spacecraft's mission. If all goes according to plan, a handful of these will be studied in depth by NASA's $8.9 billion James Webb Space Telescope, which is scheduled to launch next year. James Webb should be able to scan for water vapor, methane and other gases in the atmospheres of some of the closest exoplanets, helping astronomers better gauge those worlds' potential to host life. And, if researchers get really lucky, Webb may even spot a combination of gases that's suggestive of life itself. The TESS mission is managed by NASA's Goddard Space Flight Center in Greenbelt, Maryland, and operated by the Massachusetts Institute of Technology (MIT). George Ricker, of MIT's Kavli Institute for Astrophysics and Space Research, is the principal investigator.